Is West Brom v Brighton on TV, what's the team news, what are the odds? 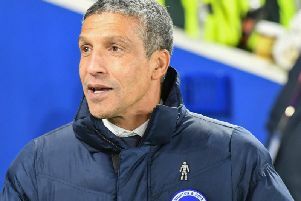 Brighton will look to end a five-game winless run when they travel to West Brom for their FA Cup fourth round replay on Wednesday. What time does West Brom v Brighton kick off? The match gets underway at the Hawthorns at 8.05pm. Yes. The match will be broadcast live on BBC One. Coverage will begin at 7.55pm, with the game starting at 8.05pm. Albion's following match, at home to Burnley in the Premier League on Saturday, will also be live on Sky Sports. Both sides made several changes from their previous game when they drew 0-0 at the Amex last month and are likely to do again. West Brom signed three players on loan late in the January transfer window - Jacob Murphy, Stefan Johansen and Jefferson Montero - but they are all ineligible for the tie. Baggies boss Darren Moore fielded a number of young players in the draw at the Amex and the likes of Sam Field, Rekeem Harper, Jonathan Leko, Kyle Edwards and Rayhaan Tulloch could again feature. Back-up keeper David Button is likely to be in goal for Brighton and Seagulls boss Chris Hughton could make numerous other changes. Bruno, Leon Balogun and Dan Burn could all come into Albion's defence and Bernardo could play for the first time since the beginning of January after a hamstring injury. Alireza Jahanbakhsh could feature for the first time since returning from the Asian Cup with Iran and Beram Kayal and Anthony Knockaert are also likely to come into the starting 11. Florin Andone, who has started both of Albion's FA Cup ties this season, is again likely to lead the line. Paul Tierney will be the man in the middle at the Hawthorns. The assistant referees will be Stephen Child and Daniel Robathan, with Jonathan Moss the fourth official. Brighton are slight favourites to win on PaddyPower at 7/5, with West Brom 9/5 and the draw 9/4. The Baggies beat Brighton 2-0 at home in the Premier League last season and a repeat of that scoreline is 12/1. The Seagulls' first ever Premier League win was 3-1 at home to West Brom at the beginning of last season and that scoreline is 19/1. Brighton top-scorer Glenn Murray is 4/1 to net first and 6/5 to score anytime. Florin Andone is 4/1 and 13/10 respectively and Alireza Jahanbakhsh is 9/1 and 3/1. Jay Rodriguez is 5/1 to open the scoring and 9/5 to net anytime, with Dwight Gayle 5/1 and 9/5 respectively and Hal Robson-Kanu 15/2 and 13/5.